High strength aluminum foil backing is ideal for rigid duct board and flexible duct. 3M™ Venture Tape™ UL181A-P Aluminum Foil Tape 1581A is a high temperature, high strength UL printed aluminum foil tape coated with an acrylic pressure sensitive adhesive that meets UL181A-P, UL181B-FX and ULC S102 specifications. Conformable foil is excellent for rigid duct board applications. The tape excels in a variety of temperatures and environmental conditions, including high temperatures. 3M™ Venture Tape™ UL181A-P Aluminum Foil Tape 1581A is a 4.0 mil, high strength aluminum foil tape coated with a cold weather adhesive. The aluminum foil backing is malleable and conforms well around corners and to irregular surfaces. This tape provides an excellent vapor seal in various duct board sealing applications. It is rugged, durable and easy to install without additional tools or application methods. 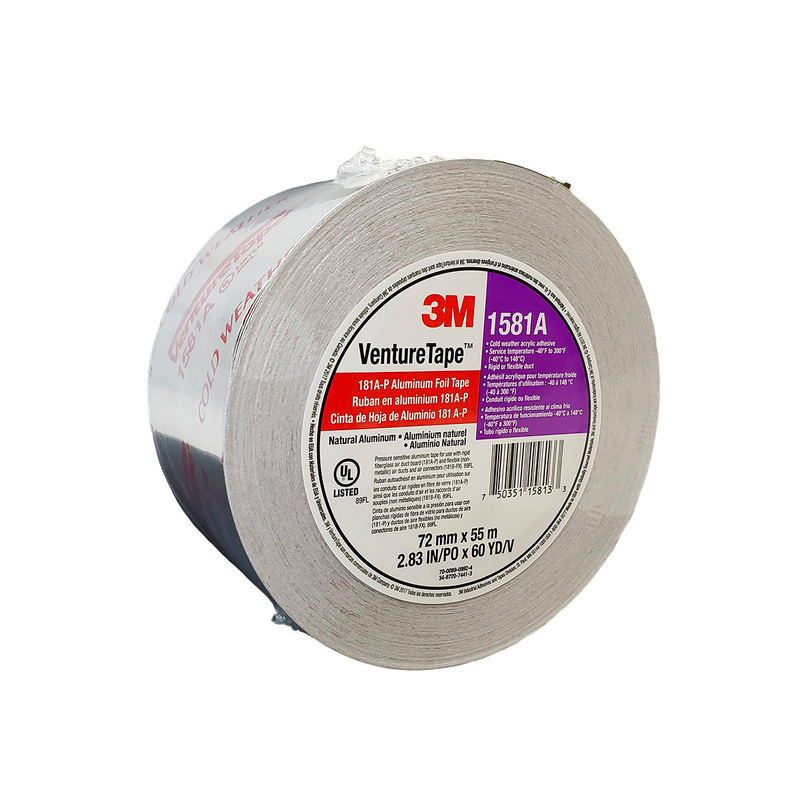 3M™ Venture Tape™ UL181A-P Aluminum Foil Tape 1581A is UL181A-P and UL181B-FX Listed. It is also ULC S102 Classified (Flame/Smoke 0/0). 3M™ Venture Tape™ UL181A-P Aluminum Foil Tape 1581A is coated with a pressure sensitive acrylic adhesive system that performs well at elevated temperatures, yet still excels under normal and cold weather conditions. It adheres immediately on contact to a variety of materials, including fiberglass. With a service temperature ranging from -40°F/-40°C to 300°F/149°C, this tape can be applied in a variety of environmental conditions. Once bonded, this tape features good aging properties that resist lifting and curling over time. 3M™ Venture Tape™ UL181A-P Aluminum Foil Tape 1581A applies easily to various types of thermal insulation, and is easily installed without special tools or application methods. The tape is conformable for consistent application even when applied to irregular surfaces or around curves. This tape can be used for seaming vinyl faced fiberglass insulation and for water heater blanket installation.